The highly anticipated grand opening of the new Global Center for Health Innovation in June of 2013 capped off one of the largest project undertakings in all of Ohio the past decade. The $465 million joint venture between Cuyahoga County and MMPI was designed to highlight Cleveland's reputation as a world class medical center by attracting future conventions, shows and events to the area. The project kicked off in January of 2011, with the first phase including the demolition of multiple buildings to make way for the future Global Center for Health Innovation facility. Precision was among the first on the scene as crews were involved with asbestos abatement, concrete cutting, sawing and selective demolition. Precision worked simultaneously in six structures with a labor force exceeding 110 abatement professionals in order to complete this high-intensity task within the tight schedule. In all, Precision removed and disposed of over 6,500 cubic yards of asbestos containing material, including 152,600 square feet of ceiling plaster, 85,000 square feet of drywall systems, 76,300 square feet of wall plaster, 37,400 square feet of fireproofing, 37,000 square feet of HVAC duct insulation and 35,200 linear feet of piping insulation. 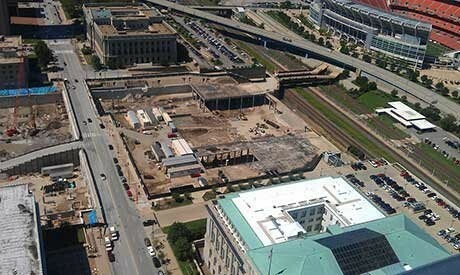 Precision accomplished the challenging selective demolition job of separating the existing Convention Center entrance attached to the west Public Auditorium prior to mass demolition without disturbing the scheduled activities of the auditorium. During the entire process, crews carefully worked around the structures in order to protect the 89-year-old façade and live utilities. Instead of scraping thousands of square feet of drywall and acoustical plaster off of masonry substrate in the nine story building, Precision mobilized skidsteers and mini excavators with fabricated custom attachments to demolish and scrape the components. Because there were no substantial freight elevators, our crews had to create an opening on each floor to hoist equipment via a crane or lull. Precision Environmental and Precision ProCut's specialized abatement, demolition and concrete sawing and drilling teams exceeded client expectations by successfully completing the project milestones ahead of schedule and staying committed to providing quality, professional services. Our team delivered on the large-scale project within three months in the dead of winter while being vigilant of the safety and schedules of the neighboring businesses in the busy downtown area. Environmental remediation at the Global Center for Health Innovation, Precision removed and disposed of more than 6,500 cubic yards of asbestos containing material with a labor force exceeding 110 abatement professionals.